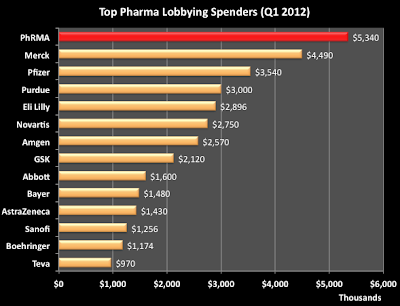 According to Open Secrets, which tracks industry lobbying, "the pharmaceutical industry as a whole spent $69.6 million on lobbying in the first three months" of 2012 (see "Pharma, Utilities and Big Ag Lead Lobbying in 2012"). Included in that category are "Health products" other than Rx medicines. 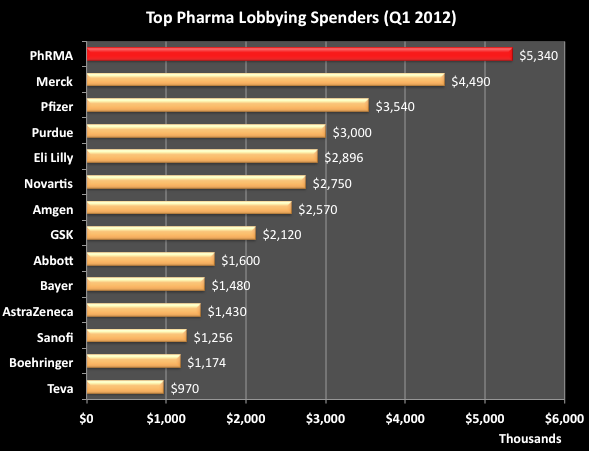 Looking at just "Pharmaceutical Manufacturers" (including PhRMA, the drug industry's U.S. trade association), the total lobbying spend in the first quarter of 2012 was $48.1 million. Annual pharmaceutical lobbying -- as measured in dollars -- increased more or less steadily since 1998, but peaked in 2009 at $186.1 million. 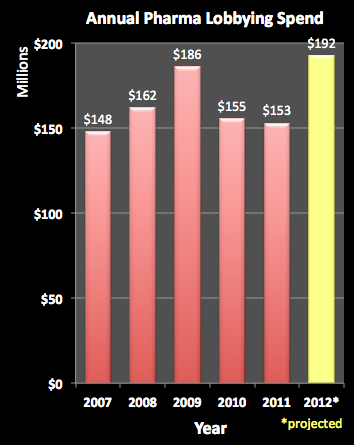 If the spending in 2012 continues at the pace of the first three months, the pharmaceutical industry will spend approximately $192.4 million in lobbying for the year (see chart; the 2012 bar is projected as 4 X Q1). Open Secrets contends that the pharmaceutical industry is "clearly focused on protecting the existing provisions of Medicare Part D, which subsidizes the cost of drugs. Critics in Congress have targeted the program for its huge cost, and some want it to be more transparent about how reimbursements are set. Also at issue," says Open Secrets, "is whether the government should be able to negotiate drug prices with the companies, something that is currently prohibited." The pharmaceutical industry is keen on preventing changes to Medicare -- especially changes that would allow the government to negotiate prices. Back in October, 2011, the Campaign for Modern Medicines (@Modernmeds) and Eli Lilly & Company (@LillyPad) hosted at least one Tweetchat on Medicare Part D to "help raise awareness on the value of the current system, and to learn how to prevent potential changes to it" (see "More Pharma Twitter Chats: Medicare is Topic" and "Was Lilly's #mmeds Twitter Chat a Discussion or a Press Conference?"). 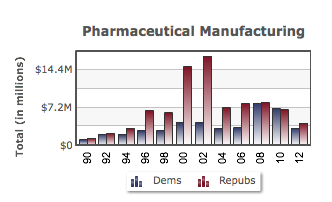 Although it is difficult to link lobbying spending with specific bills in Congress, the drug industry -- especially through PhRMA -- is also lobbying hard to get a favorable PFUFA (FDA funding) bill passed (see, for example, "Angry PhRMA, Level 1: PDUFA"). It seems that the drug industry was intent on getting Republicans elected in 2000 and 2002 and when that was accomplished, they cut back and reaped the benefits of the status quo, or as some would say the "do nothing" Congress.